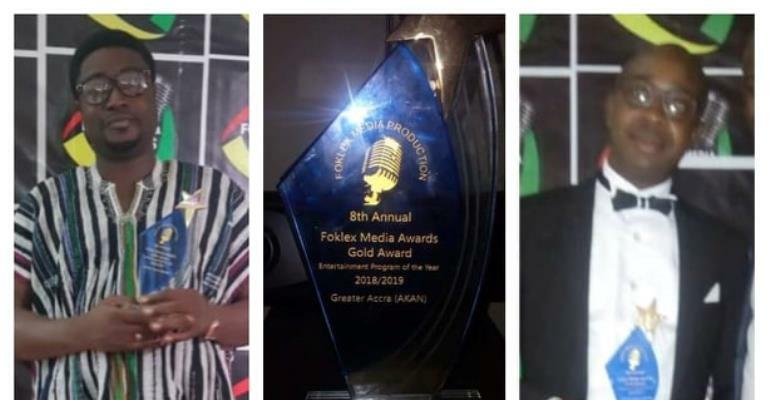 FP Communications and S Giants Broadcasting, managers of Accra-based popular radio station,Hot 93.9FM , Fox 97.9 FM (Kumasi),HotfmOnlinegh.com and Fox 103.1 FM(Takoradi) underlined its credentials as one of the most authoritative media organizations in the country by grabbing three(3) awards at the 8th edition of Foklex media awards. The Foklex Media Awards, recognizes excellence and hardworking Radio Personalities who have endeared themselves to their listeners. Winners where selected from across several fields in the broadcasting industry across Ghana. In the Greater Accra Region, Hot FM's main entertainment program,'Hot and Classic Showbiz review, hosted by Ebenezer Anderson aka Dr. Who was adjudged best Entertainment show of the Year in the Akan Category. Social Program,'Nyasem Hwe' ,hosted by Kofi Yesu also on Hot FM was adjudged Best Social Program Of The Year in the Akan category. This feat goes a long way to solidify the amalgamation's vision to lead the media space not just in Ghana but in Africa by 2021. The much-publicized event, was held at the National theatre on Saturday April 13,2019. Patrons were thrilled with ameliorating performances from seasoned artistes such as Kofi Kinyaata,Adina,Obibini and legendary Rex Omar.